You are currently browsing Ailbhe’s articles. R gets up about 6am, gets dressed, makes his tea and my coffee, puts a box of cereal on the table for Eldest, leaves to catch his train. Eldest gets up about 6:30am, gets dressed, eats breakfast. I get up about 6:45-55 (R phones me at 6:55 in case I miss the alarm) and go downstairs to help her with the final bits of leaving the house. She leaves at 7:20 to get two buses across town to school (since it got too cold and dark to cycle; she hasn’t resumed cycling since the mornings brightened). She could leave later but she prefers to be in plenty of time with all her stuff well-prepped. I usually go back to bed to find Youngest has got into the warm bit and is waiting for morning snuggles. But sometimes there’s a delivery or – as recently – some house repairs meaning builders etc arriving at 8. Middlest wakes about 8 ish usually. Then there’s “our day” which is as variable as it ever was, except that since I got ill we don’t go out as much. And about 3:30pm I start to wait for Eldest to come home from school. There are Drama, Swimming, Guides, and Rainbows on Monday-Wednesday, and Thursday and Friday we have clear afternoons at home. When Eldest rejoins the family, I have a guided chat with her about her day, one school period at a time, and we figure out what homework is needed when and whether there’s anything I need to talk to the school about, sign, buy, photocopy, sew, etc. Then I attempt to supervise homework, which is variable in quantity and boringness. And then we argue about not eating what’s for have dinner, attempt to prep school bag and uniform for the following morning, and watch things on TV, YouTube, Netflix, iPlayer or whatever. We didn’t used to have bedtime TV but for some reason we developed a regular bedtime screaming and TV seems preferable. Eldest goes to sleep earliest, and gets up 90-120 minutes before the others too. She winds down by playing games on her smartphone and watching YouTube videos about other people playing games. Managing kids’ internet access is a whole raft of terrifying I don’t really feel equipped to deal with, but we have to figure it out somehow. Middlest is currently watching Downton with R, and Youngest is rewatching Call the Midwife with me. That’s the basic structure of our day, around which the rest is built. Or falls. I sent this months ago but found it when sorting through school-related email earlier today and I think it’s worth remembering. I have found three resources teachers might find useful in understanding how Autism affects executive function and the ability to plan, begin, carry out and finish tasks, and the ability to manage the timeframe in which this happens. I cannot judge how much her teachers will already know or what information they already have on how best to help autistic students, but I know that although we have a plethora of support strategies in place at home she will also definitely need help at school for these long-term tasks, due to executive dysfunction. (2) This page by Prof Tony Attwood is both old (2000) and focused on primary school age children, but the information about executive function is good though the suggestions are not perfectly relevant. I haven’t posted since July of last year, because so much has happened it was all too daunting. I’d quite like to do a series of catch-up posts. Eldest is a joy and a delight and has started school, and is the first in our family to have a confirmed diagnosis of Autism, though won’t be the last by a long shot; which of us is next depends greatly on waiting lists. School has been a massive, massive change for everyone in the whole family but she loves it and we love her particular school. Middlest is a joy and a delight and cooking up a storm. Youngest is a joy and a delight and gathering her numeracy wits about her. We’re at our most child-led ever, because school pushed me right over that – it’s the most child-led thing I’ve ever done, I think. So we’re more child-led with the other two as well, now, and it’s interesting to watch. Today, we are trying to devise a schoolwork and homework management system so nothing gets lost or crumpled, cooking croque-monsieur and making salad, and stomping about upstairs doing very busy and important things. 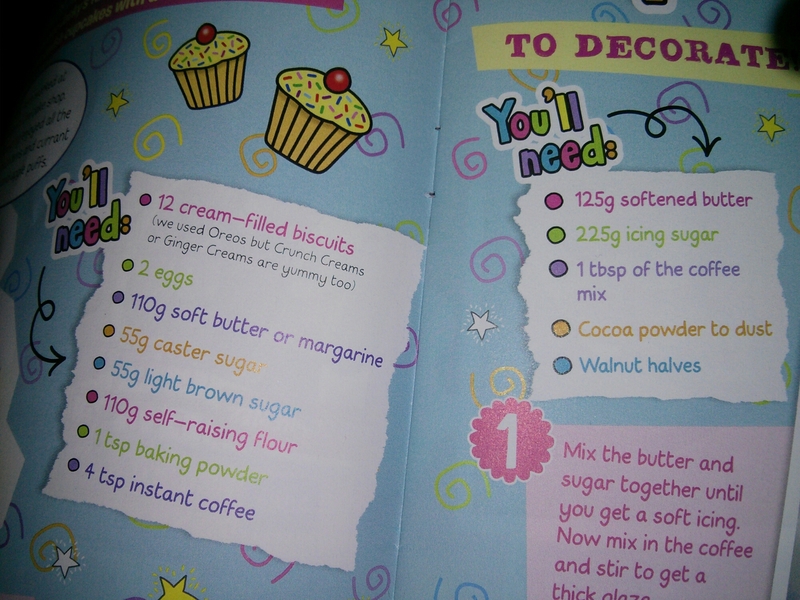 11yo got a magazine in May with a recipe in it. On Monday she demonstrated an ability to clean up after preparing a snack in the kitchen, so yesterday we went out and bought the ingredients, and today we baked. No, she baked. I just sat by, prompting, reading instructions aloud, and helping maintain focus and calm so that the project could be completed. We started with a clear, clean table, and a tray, because keeping things collected helps avoid chaos. Then we gathered the scales, mixing bowl, stirring and measuring spoons. After that we gathered the ingredients for the cakes, but not the toppings. With all that ready, we were able to check the oven was empty and set it to preheat. Then she weighed her ingredients. Flour first, then sieved into the bowl. Two kinds of sugar. Marg. The battery on the scales went flat but we figured out, using arithmetic, that it was probably OK to within a gramme or two ( we were right). As she finished with each ingredient she put it away. She broke the eggs into a little bowl on a plate, to guard against eggshell and spills, and then I put the mixing bowl on the stand mixer and she switched it on. She measured coffee for flavouring. The instructions said to get an adult to add the hot water to the coffee, so I did that bit. When the mix was all done she put a cookie in each of the cupcake cases and then used two spoons to transfer the mixture. She tried to put the tray in the oven but the blast of heat was too much, so I did that. She set a timer, then cleared the last of the baking from the table and wiped her tray. 8yo recently asked if all the things were made up of really, really tiny things, squashed closed together. It turned out she was talking about molecules, and a few days later she worked out that the air is also made of molecules. I’m not sure where that train of thought came from, but today she asked about infinity and went Ooooooo when I gave a potted explanation. Her maths is money-centric and she’s getting interested in the tricks you can do with a compass. 4yo can swim underwater and is getting to grips with a bike with pedals. She can write LVOE MUM and does, frequently. She can count and add up and draws with her eyes open and then tries to reproduce her drawing with her eyes closed, which is hilarious and surprisingly accurate – humans are better at this than I’d have guessed. 11yo has been practicing her handwriting, because she has decided to start school. She picked a school and we applied and she’s been to see it a few times, and today she had a first transition day. She’s really looking forward to the next one, and to starting. I’ve made a spreadsheet to calculate where to buy which bits of uniform and how to budget for them. We’re going to save money though because when she outgrows her school trainers and shoes I can have them. Did you know girls’ school uniform blouses come in a variety of shapes including a “no peep” style? We’ve just renewed the Aquila magazine subscription and I’ve also sent for a trial of First News, a weekly newspaper for children. In general the newspapers are too gory and upsetting but they try to read them anyway, so this is worth a try, I think. Today was the first taster/transition day for the 11yo in her new secondary school. We had some amazing weather. Everything in the garden is growing beautifully. We’ve planted more food than we ever did before. The 11 year old reminded me that apples are related to roses. 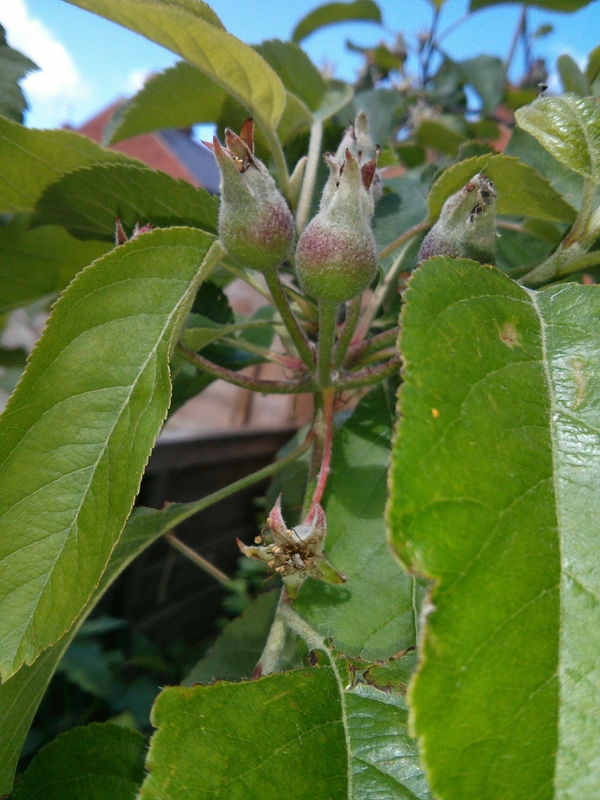 I thought vaguely of wild rose flowers and apple blossom, but it was when I saw the baby fruits forming from the middle of the flowers that I understood. The 8 year old has been practicing crochet and has a sizable blanket. She also makes scarves for presents. Her latest wheeze is to draw a picture with her right hand and then copy it with her left. She is getting quite competent. Handwriting is also improving for everyone. I keep finding lists; wish lists, friends lists, shopping lists. The four year old is learning to cycle. She’s OK on a balance bike but not quite expert enough to use it for transport yet. She really, really wants pedals. Logic puzzles are surprisingly appealing to the 8yo. I’m seriously considering banning Horrid Henry audio books from the house. Libraryelf.com may yet save our lives. And we’ve all learned a lot about democracy over the last few months. 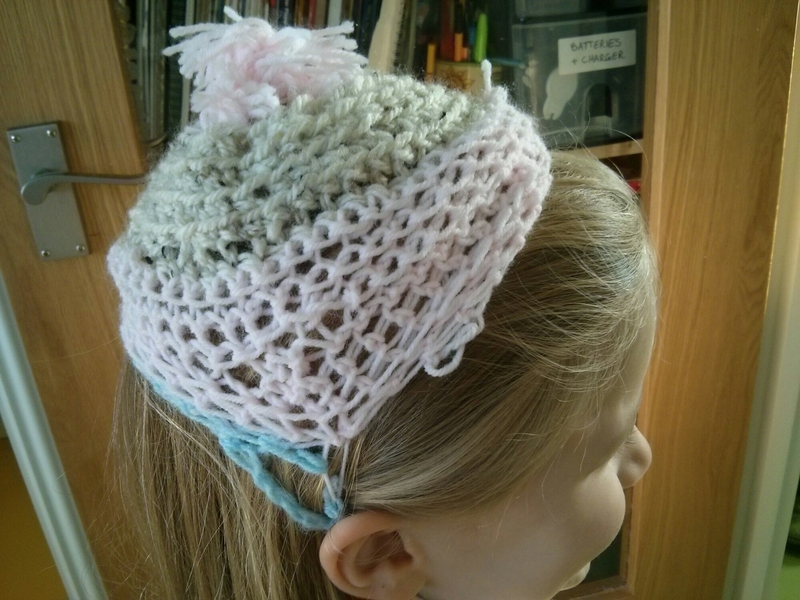 Apparently the 8yo is teaching herself crochet. I’ve shown her one stitch. At dinner last night, 10yo asked “What’s a megabyte?” and we ended up with a discussion of counting in binary (she found it easier than I did, but I didn’t learn until I was 20), how old-fashioned hard drives work, what a floppy is, and other things she learned she didn’t know while reading User Friendly, which is how I learned where my books of User Friendly are now. Then I spent the evening watching David Attenborough with a 4yo who refused to go to sleep. Today I learned that the 8yo has learned to read inside her head so she can read while eating. I have no idea how long she has been able to do this, because looking at books without reading them and reading silently look and sound very similar from the outside. There was a WordPress security issue and I did precisely nothing about it except switching off admin rights. Er. Anyway, I’m here now. I’ve been ill — over Christmas there were five days I wasn’t well enough to get dressed at all, and there are many more days when I can’t dress until after noon — but education still happens, because that’s what being alive is about. A while back I gave my (probably dyslexic for writing as well as reading, definitely with coordination issues) eldest a few lessons in correct letter formation and then ignored her for months. She’s ten. Ignoring was a good idea, it turns out; her handwriting improved so much her Nana didn’t recognise that the Christmas cards were from her. It’s a reasonable size and perfectly legible, now, and she doesn’t hate writing or feel she’s a failure at it. Laissez faire FTW. My handwriting goal here is simple: I want her to become an adult who can read her own handwriting. The 8yo is reading more and more, and listening to ever more complex audiobooks, though we’re not letting her have Harry Potter and the Goblet of Fire because the ending is too upsetting for us to cope with helping her through it. Independent reading and independent ingestion of texts aren’t the same skillset, it turns out. Who knew? Her handwriting is variable but I’m not bothered by it; she writes what she wants when she wants to. Both older children have phones for text-messaging, which is supposedly helping them learn to spell. It feels a bit odd to give a phone to an 8yo but she hasn’t taken it outside the house so far. The 4yo has moved on to asking for a chapter book occasionally, though she’s not thrilled by the lack of coloured pictures, and she’s writing on and off, when she wants. She doesn’t enjoy Reading Eggs lessons, possibly because we don’t have any good computer/mouse setups. I’ll try something else later. And now the children want me to do interacting, toodle-pip.